Film: A poor 1944 version that changed much of the show and eliminated a lot of the score. It’s possible that talented High Schoolers could do this show. A fine show for colleges, universities, Little Theater groups with a decent talent pool should consider it. Dinner Theaters could do it with minimal sets. Stock companies, theater companies specialized in Musical Theater, should consider it. A great production might play on Broadway, but I don’t know if the score is memorable enough for that. This show is political. It’s about the idea of big “benevolent” government vs. self control over one’s life. If such discussions dismay you or your audience, skip this show. Your lead, Peter Stuyvesant, really needs to be a charismatic “star” type character actor. If you don’t have an actor right for the part, this isn’t a good show for you. As Irving looks on, the scene shifts to Manhattan, 1647. Dutch maidens swab the pier (“Clickity-Clack”), and the town council (“Entrance Of The Council”) headed by Tienhoven, sights the ship carrying their new Governor, Peter Stuyvesant. To honor him and prove they are diligent public servants–though they admit to under-the-table dealings (“Hush-Hush”)–the council members decide to hang a convict. But there are no prisoners; they have all escaped. Stuyvesant is preparing to gun down the mutineers when Washington Irving intervenes. He advises Stuyvesant not to fire so he will not seem a ruthless tyrant to posterity. Stuyvesant has a change of heart; he pardons Brom and allows him to marry Tina. Then he allows that he may be an American, too, since he was never able to take orders, either (“How Can You Tell an American?” reprise). Hits include “September Song” (the most beautiful song of the 20th century, in my opinion). “How Can You Tell An American” is a theatrical masterpiece. “It Never was You” and “There’s Nowhere To Go But Up” are gorgeous. As always, feel free to skip or ignore my opinions and rating. Don’t be surprised though if your production is no kind of holiday. One thing, quickly, there are actual historic characters in this piece, including the great American writer, Washington Irving, and Pieter Stuyvesant. That said, there is a bit too much of a good thing, here. And the show runs long. But the solution is then obvious! Cut! The show takes a long time to bring on its star, Peter Stuyvesant, too long. He is the most charismatic character in the piece, one of the most interesting characters in all of Musical Theater. And though the earlier material presenting the council of bumbling Dutch administrators is very funny, it could be cut in half, with little loss…if done with loving care. That could drop as much as ten minutes from the show, something that really does need to happen. You’ll be cutting some laughs, but do it, anyway. What can’t be cut are lyrics, which are generally overwritten. Anderson was no one’s idea of a lyricist. He was a marvelous playwright, a dramatist almost without equal in the United States at that time, and a fair to good poet. But he rarely knew when to put down the quill pen. The lyrics are filled with large, difficult words, words generally not p[laced into lyrics by experienced lyricists because they know better. The audience gets one shot at hearing the lyric and understanding it. The song passes by, the play passes on, and if they don’t get enough of the lyrics, the audience passes out. No one has ever accused Anderson of brevity, and lyrics, by definition, are the soul of compact expression. Of the written elements in this show, the lyrics are the weakest. They are not bad. They are too much, too complex, too many words, too many syllables squeezed into each line. I think Anderson was aware of this, for he repeated many of the choruses in Gilbert & Sullivan style, repeatedly. There are exceptions, lyrics that sound more like lyrics and that work well. But the lyrics tend overall to ramble and be intellectually challenging. However, the text is bold. It’s broad, and often very funny. And it’s pointed, a political and social statement relevant always. It will absolutely work today, if done well enough. It is, in fact, somewhat similar in its ideas and its overall feel, to Gershwin’s Pulitzer Prize-winner, Of Thee I Sing. That show has a sharp, clever script by George S. Kaufman and Morrie Ryskind. 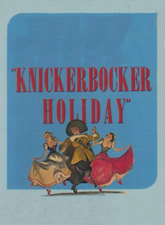 I think this show is funnier, and has at least as memorable a score, while being more pointedly political and “American.” Given a choice, I’d do Knickerbocker Holiday. And it sports the music of the finest composer in Musical Theater history (my opinion), Kurt Weill. His second Broadway musical (after Johnny Johnson), Weill outwardly seems to have made a spectacular transition from Germanic opera, of which he wrote many, to American Musical Comedy. Only not so much. In 1928, he had offered the world The Threepenny Opera, and shortly thereafter, Happy End. Both were filled with jazz-influenced American-type songs that are unforgettable. He had long since taught himself to orchestrate with minimal instruments, and to integrate contemporary instruments like the sax into his pieces. Remember, this is the man who composed “Mack The Knife” as a part of The Threepenny Opera. In it’s day, absolutely no show from any country was more popular. Weill would continue to compose Broadway shows until his unfortunate early death in 1950, and they would provide numerous hit songs. But no song (by anyone) is more beautiful than “September Song”. The story of it’s authorship (various versions) is interesting. Supposedly, when Huston agreed to play Stuyvesant, he was on the West Coast, and Anderson and Weill were in New York. Huston did a radio show that night and sang a little song for two avid fans, the two men writing him a Broadway musical. Anderson and Weill decided instantly to give the old man a ballad, one about getting older and running out of time. That night, “September Song” was born. I think this show is waiting. It’s waiting for a very smart producer and director to shave it down to size, and present it as a bright, aggressive, edgy Musical Comedy, with a warmly beating heart. There are almost no shows from the 1930s worth looking at producing today – their books usually sink them. That isn’t the case with Knickerbocker Holiday. It can and should be revived with a smart, well-paced, slightly edited production, and with a star playing the lead. This show will work, and work well…but it must be done very well. It’s a Weill score. The orchestrations (his) are complex, and require good players. The vocal parts are close to operatic (except for Stuyvesant), with large ranges. The songs are filled with unusual turns and intervals that always work, but are often unexpected and take time to learn. Some of the pieces might be difficult to play for other than a fine pianist. All together, the show requires an experienced Musical Director who can work easily with well-trained voices, as well as Musical Theater material, and who will respect the brilliance of the music. Pieter Stuyvesant – Lyric baritone. Must sing with emotion and intelligence. The characterization will be more important to the role than great vocalize, though a fine singer who can really act with charm would be welcome. Must handle lyrics very well. Needs to have at least an E on top. Needs to be comfortable up at C.
Washington Irving – Lyric baritone. Clean, clear, warm voice, with a bit of an edge. Needs a fine voice, good at handling dense lyrics. Needs a clean A on the bottom (below middle C), at least an Eb on top. Needs to sing with energy and commitment, always interested in his own ideas, discovering them even as he sings. Brom Broeck – Romantic, almost legit lyric baritone with a full mid-range, well-supported, and some decent high notes, needs a clean Eb on top. Sings a lot. Needs a clean Ab on the bottom (below middle C). Must handle some counterpoint well. Tina Tienhoven – Soprano, trained, clear and supported mid-register, some good upper notes. Needs at least a clean G, and an A is better. Must handle some counterpoint well. Tienhoven – Lyric baritone, character-driven voice. Needs an E on top. All of the council needs to be able to get to at least an Eb on top. Roosevelt – Lyric baritone with good higher notes. Character-driven delivery. Poffenburgh – Baritone, should be able to sing “martially”, with energy, if puffy. Ensemble – Melodically the pieces are simple for Weill, but more complex than other composers often create. The harmonics are basically block harmonies, not too hard to learn. But there is a lot of it. The show could support a fair amount of movement, but almost no “dance”. The score is energetic, but almost legit in its vocal demands. That will preclude much dance. But there are numbers that will profit by some exact and clever movement. A Choreographer may be involved in the staging of “Clickity-Clack”, “Entrance Of The Council”, “Hush Hush”, “How Can You Tell An American”, “One Touch Of Alchemy”, “The One Indispensable Man”, Young People Think About Love”, “All Hail, The Political Honeymoon”, “To War!”, “May And January”, “Dirge For A Soldier”, and “No, Ve Vouldn’t Do It”. Rather than break down each number, I think a general understanding of the movement in the show will be more helpful. The “Dutch” quality, representing that famed, small establishment of some 600 immigrants near the Hudson River, should feel antiquated, wooden-shoeish perhaps, and Dutch. (Look at paintings of the Dutch from the period.) Movement can be dainty, European, and controlled in numbers reflecting that sensibility. But when there is rebellion, it’s American. “Our Ancient Liberties”, and “No, Ve Vouldn’t Do It” are rebellious numbers, as is everything Brom sings. This would especially be true of “How Can You Tell An American”. These should have more open energy, more of a relaxed, self-possessed quality, natural, less restricted. Create this dichotomy in the movement without intruding on the singing and acting, as your performers will be very busy. Finally, there are a few ‘show tunes”, comic numbers that are very theatrical exchanges, including “Hush Hush” (which could be presented as a bizarre minuet of sorts), “The One Indispensable Man”, and “Young People Think About Love”. These should be fun and funny. “The Scars” should be a one-legged soft shoe, and a show-stopper. If you don’t know what soft-shoe is, you’re probably not equipped to choreograph this show. There is, in Act II, an Indian attack. Keep it entirely offstage to avoid embarrassment! It is written to mostly happen unseen, keep it all that way. Flying arrows, maybe, or a special effect where arrows “stick” into walls or doors. Perhaps one in Stuyvesant’s leg? One more directorial note – the show starts on page one to violate the fourth wall. Irving speaks directly to himself and the audience immediately. This is a “show”, representational and theatrical. No pretense to “realism” should ever be made. Staging should be fun and aware of the audience as an audience, a fact alluded to in the closing scene of the show. The “future” is watching Stuyvesant, says Irving…in the form of the live audience. The show could use an experienced Choreographer, but doesn’t really need it if the Director is comfortable staging groups and small numbers. A consistency in the tongue-in-cheek feel of the show is more important than a lot of movement. A note – the provincial council speaks in a sort of pigeon English-Dutch, carefully written into the script, a bit of a throwback to the Dutch Comics of Vaudeville. Some of this is funny, and after all, the action takes place hundreds of years ago, so there’s no “politically correct” stance against it. But Stuyvesant does not speak with an accent, being educated and from Europe. Unfortunately, neither do Tina and Brom – I guess because they are younger, the next generation. If you use the accents, you’ll need to try them out at auditions. Or you could not use them. Pieter Stuyvesant – Mid 40s-50s. Driven, single-minded, a martinet of the worst kind. Imposing, even commanding. Brooks no defiance whatsoever, while believing himself to be fair-minded and benevolent, courageous at need, willing to place his own life on the line – a redeeming quality. He admires courage in others, and intellect, so long as they do not threaten him. A violent temper. Willing to break the law for his own profit, as all the government officials in the show do. Charismatic (extremely, or the show won’t work). Requires an exceptional and commanding actor with charm and warmth – we must like him even at his worst! Cast for acting, voice, type, some movement, in that order. (He does an almost soft-shoe with one leg, in “The Scars”.) A star. Washington Irving – Our “narrator”, the great early American writer, the first American novelist and short story writer to acquire a reputation internationally. He is age 26, and looking for a profitable story to tell. This show is that tale, and he creates it as he goes, intruding into the action often. Smart, literate, creative, dryly amusing. Cast for acting, voice, type. Must be very strong. Brom Broeck – 20s, a strong, tall, handsome, manly, determined young man. He is a man with his own mind, and is desperately trying to fit in with his fellow men – but he can’t set aside his ethics, his idea that a man should dictate his own rules, not a government. The “first American”, determined to live his life his own way. His honesty and sense of good will and fair play should be irresistible. Cast for voice, type, acting. Must be strong. Tina Tienhoven – Late teens-20s. Beautiful, preferably stunningly so, a blossoming young woman. She grows into a self-possessed, angry young woman before our eyes. Like Brom, she wants to fit in and “be good”, but she is in love with Brom and cannot deny herself. She feels trapped in Stuyvesant’s plots. Cast for voice, type, acting, some movement. Cast this role well. Tienhoven – 40s-50s. Tina’s father, a government man, made rich from his illegal activities selling guns to the Indians – who later attack the settlement. A weak, greedy, small-minded and cowardly man who finally develops a bit of a spine at the end. Cast for type, acting, voice, some movement. Roosevelt – 30s-50s. Another member of the council. More stubborn than some of the others, a man who does ask questions and doesn’t like everything that is happening. The first to rebel. Cast for acting, type, voice, some movement. Tenpin – 30s-50s, a wiry, smaller man, energetic, nervous, a strong comic actor. Cast for acting, type, voice, some movement. Schermerhorn – 40s-50s, the jailer. A large man, s low of mind, practical in small-minded ways. Cast for type, acting. Poffenburgh – 40s-60s, the “General” of the “army”, a large, breathless, puffy man. Cast for type, voice, acting. Vanderbilt – 30s-50s, another member of the council. Cast for acting, voice, type. Ensemble – Dutch. You’ll need an ensemble of young men and women, attractive, who can sing and harmonize well, look like Dutch, and do some acting and movement. Keep the sets very simple if you can, so the show focuses on the script, score and performances. An 1800′s desk and chair, and quill pen and ink, can be set all the way downstage to one side, on the apron, for Irving. He can even watch the action and intrude into it from this spot. The Battery is the main set, and could include all the action to follow, making this a one set show. A pier to one side, representative rather than literal, the river in the background. 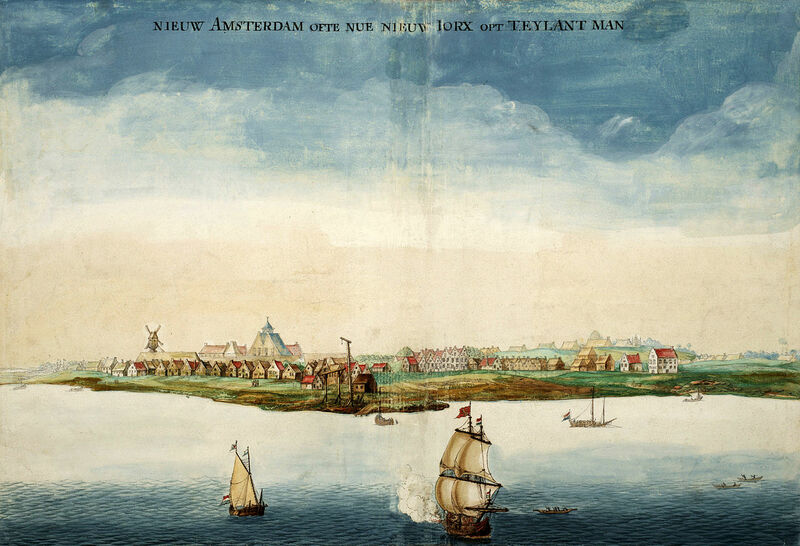 Five-six peaked houses represent the small city of New Amsterdam. A gallows near center, perhaps. A jail, closed, that might open up like a story book to reveal action, with a barred window upstage. That’s it. Lots of earth tones, but get flags in there appropriate to Holland in the 1600s, and some other color. These people are not far removed from nature. These are places and people that really existed, and which can be researched. The one set should be creative, functional, interesting and evocative, but not literal. And don’t forget the windmill. A job for a creative and interested Set Designer, without tons of expertise being much required. One specialty note – Brom must be able to be “hanged” by his waist, suspended a bit over the stage. This may take some work, certainly a solid “gibbet” and perhaps a harness. A job for an experienced costumer. Much of this will need to be rented or built. Get the hats and shoes right, too. Arrows that appear in walls! (A special effect, obviously.) A stretcher. Guns (rifles, in the period). A quill, ink and paper for Irving. There’s bound to be more. As it’s all period, you may need to rent or build some props. A job for someone with experience. This is “theater,” without pretense to “reality.” Make the lighting fun and interesting. Stay away from follow spots, but you can use pin spotting for “September Song” and a few other moments. Lighting should be overtly theatrical, bright, fun. It should pop. A job for an experienced Lighting Designer. Unobtrusive, people should not look made-up.. The women may require wigs! Even the men might! That will be your biggest assignment. Make sure Tina is lovely in the light. A job for someone with some experience. Director, Musical Director, Set Designer, Lighting Designer, Costume Designer, Stuyvesant. Will the Anderson and Weill estate allow this show to be properly trimmed and shaped for modern production? If so, I think it’s a sleeper, a show that could startle a modern audience (and critics). Even as written, it’s more interesting than 3/4ths of the shows that get to Broadway today. And it has “September Song”. Here’s a show that deserves very much to be rediscovered.